Fennel gives a licorice-type flavor to foods and is also sometimes used in herbal remedies for aiding digestion and minimizing colic symptoms. 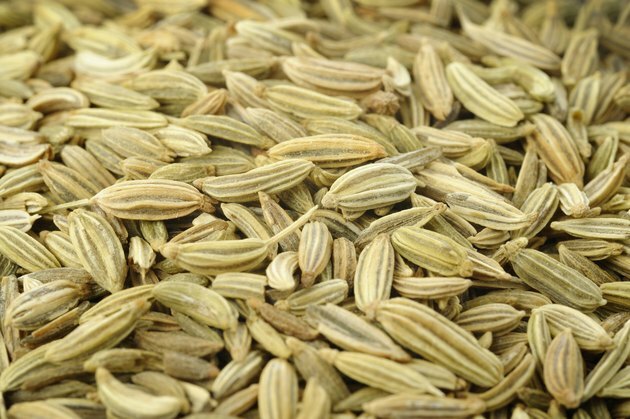 Check with your doctor before eating large amounts of fennel seeds, however, because it may not be safe for everyone. Fennel may make your skin more sensitive to the sun, potentially leading to sun poisoning in some cases. It can also cause skin reactions, and young girls who have used fennel may be more likely to develop breasts prematurely, according to Drugs.com. Choose fennel seeds instead of fennel oil because the oil sometimes causes seizures and hallucinations. Fennel may interact with certain medications, preventing them from being metabolized properly. New York University Langone Medical Center recommends taking ciprofloxacin and other fluoroquinolone medications at least two hours before or after fennel or, preferably, avoiding fennel altogether if you're using one of these antibiotics. This is because it isn't clear if allowing time between taking these substances will eliminate the reaction. The safety of fennel use for young children and people with kidney or liver disease hasn't been clearly determined. Pregnant women should avoid fennel, which may bring on menstruation and cause a miscarriage. Although some nursing mothers use fennel in an effort to increase milk flow, it isn't clear whether this is safe or effective. Fennel contains a substance called estragole, which has been linked to tumors in animal studies. This doesn't necessarily mean fennel isn't safe for people, however, because it contains many other substances that may counter the effect, according to an article published in "Evidence Based Complementary and Alternative Medicine" in 2012. More research is needed to determine whether fennel seeds used in the typical herbal remedy doses actually increase cancer risk in people. How Much Fennel Tea Is OK?